*By posting this steak stuffed collard rolls recipe I am entering a recipe contest sponsored by The Beef Checkoff and am eligible to win prizes associated with the contest. I was not compensated for my time, however I am an active member of the 2014-2015 Beef Checkoff bureau. As a certified trainer and nutrition coach, I know the importance of adequate protein intake. Research has shown that getting 25-30 grams of protein at each meal, not only helps with satiety but can aid weight loss, improve body composition and support a healthy metabolism. One of my favorite sources of quality protein is lean beef. It has 10 essential nutrients and tastes delicious, too! 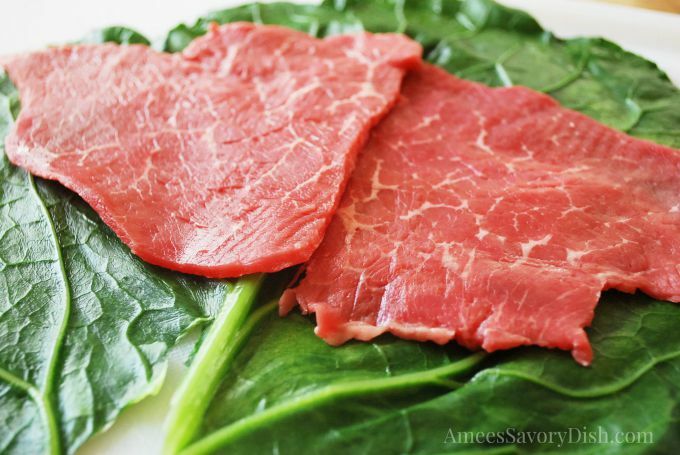 Beef is the #1 food source of protein, vitamin B12 and zinc, not to mention a great source of iron! There are many beef cuts that fall into the lean category, probably more than you realize. You can read about which ones make the cut and how to prepare them at the online interactive “butcher counter” at BeefItsWhatsForDinner.com. Along with lean protein, it’s really important to eat a variety of colorful fresh fruits and vegetables, whole grains and healthy fats for optimum health and wellness. Whole foods do a body good! 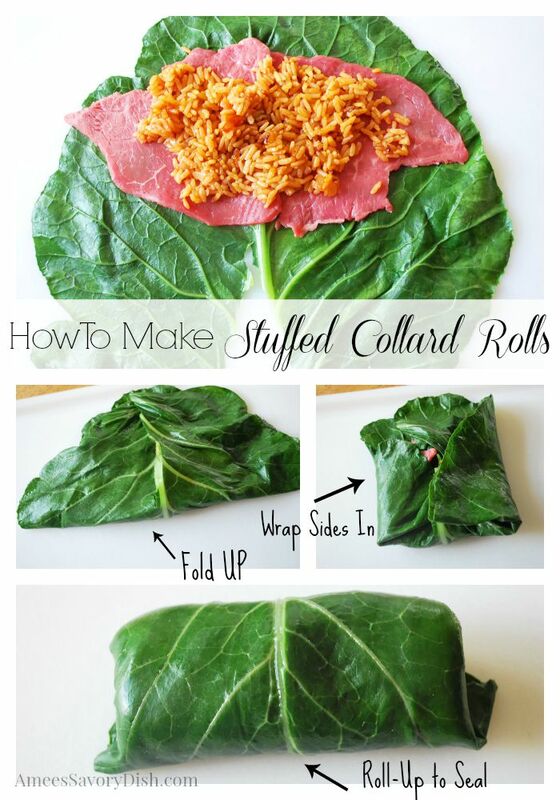 I created these collard rolls for this recipe contest through Recipe Redux, sponsored by The Beef Checkoff. I wanted to develop a healthy dish, while embracing my southern roots. Southern food doesn’t have to be drowning in butter and fat to be incredibly delicious. I like to prove that you can have delicious southern cuisine that’s also full of good nutrition. 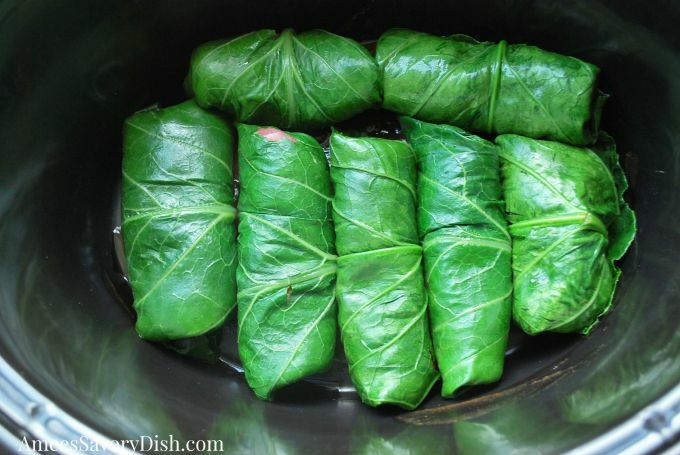 These collard rolls seemed like the perfect dish and they’re really darn tasty, too. 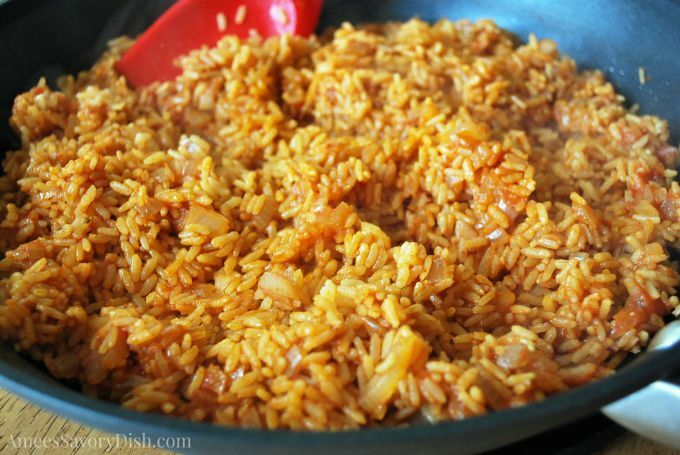 There are some important steps to share when making this recipe. 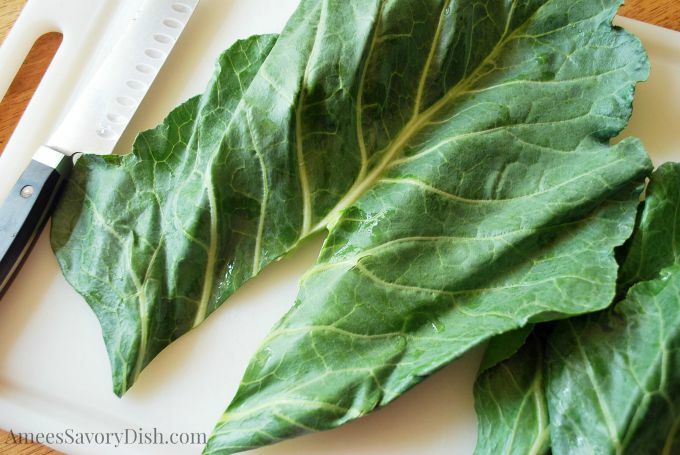 The first one is making sure that you have removed the hard stem from the collard leaf before steaming them. I go pretty high up, until the stem is flat with the leaf and not as rigid. 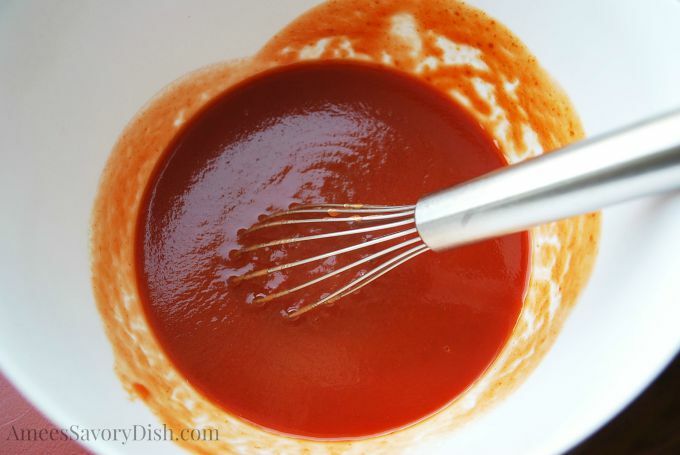 Next, whip up the sauce. Also, it’s really important that you have a pretty thin cut of sirloin tip steak for easy rolling, like this one…. Next, you’re going to assemble your rolls. I’ve put together this tutorial on how to roll them. The last steps are layering rolls into the crockpot, covering with sauce and letting your slow cooker do the rest of the work. I served these with hot sauce, because…well….I love hot sauce! I put that s*@# on everything! 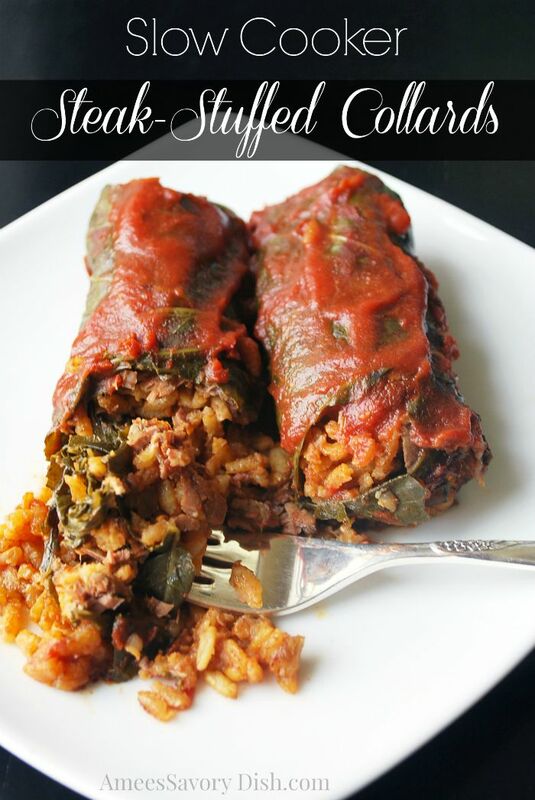 It’s so good on stuffed peppers and I love it to spice up these collard wraps! Enjoy! For more recipes and beef preparation tips and tricks, don’t forget to follow The Beef Checkoff on Twitter, Facebook, Pinterest and YouTube. Here are more fabulous lean beef creations from my Recipe ReDux friends below! I love sneaky veggies! Thank you Elizabeth! So unique and a fab and fun way to get in your leafy greens with your protein! When I was a girl Cabbage Rolls were my FAVE dinner. Totally going to try this brilliant recipe! Love all the prep pics. Such a creative idea, Amee! Like a southern spin on grape leaves! 🙂 Love it!! After tasting these today, I can tell you…they are GREAT! Wonderful job with this recipe Amee! That’s so awesome! Thank you, Karli! I’m thrilled that you all enjoyed them! 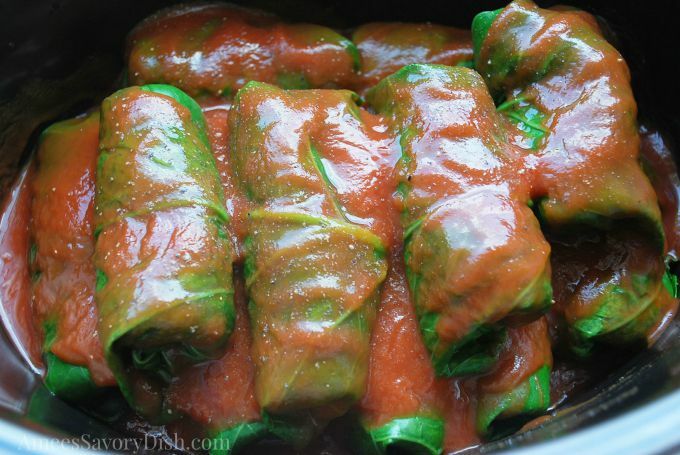 Congrats on winning the big prize with this awesome ReDux of the old school cabbage rolls! Just shared your winning recipe on our ReDux FB page!